You are here: Home » News » Do you want to learn more about the police? Do you want to learn more about the police? Citizens Academy is a rewarding programme that communities can take part in for free. The academies aim to teach the public about what we do, why we do it and attendees get the opportunity to see first-hand the daily workings of their local police force. Academies are held in local community hubs over a number of weeks and are open to anyone over the age of 17. Local people are asked to commit to attending a two hour session each week and, at the final session, are presented with a certificate. Each week focuses on a different aspect of policing from front line policing to the work of some of the more specialist departments such as training and forensics. The academies also cover topics of public interest such as anti-social behavior and hate crime. We aim to highlight every part of the force, even those areas that are often overlooked or not at the front of local people’s minds. In the past courses have been run in Portishead, East Bristol, Hartcliffe and most recently Bridgwater. 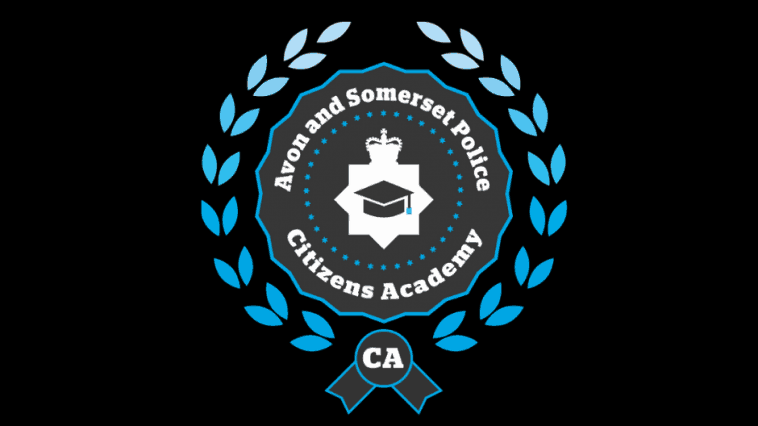 The next round of Citizens Academies have now been confirmed as Weston-super-Mare, Knowle, Bath and North Bristol. Hear more about Citizens Academy from people who have completed the course, Alec Western graduated from the Bridgwater course and Sue Harding from Patchway.